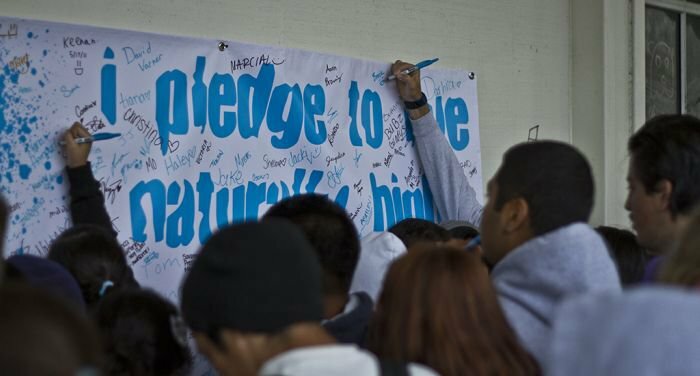 On the morning of Tuesday, May 17th, 2011, more than 80% of Rancho Buena Vista High School’s 3,000 students stood up and took the pledge to live naturally high. Megan Hastings, Natural High’s summer intern, suggested the idea of a Natural High Pledge after being inspired by Seventeen‘s Body Peace Treaty Pledge. Michelle Ahearne, executive director of Natural High, and Allura Garis, youth marketing associate of Natural High, were fascinated by the idea and immediately put their plans into action. The pledge would give the youth a chance to take action and be directly involved in the cause. 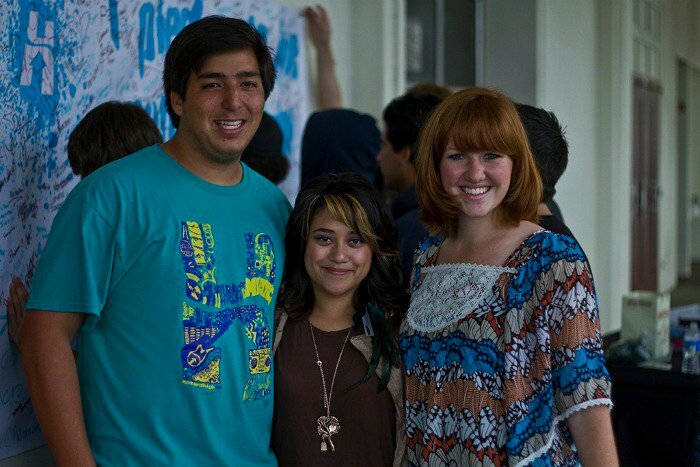 The first ever Natural High Pledge was held on that day, and Rancho Buena Vista High School became the first school to have the Natural High Club, founded by Mitch Medrano, with Jenna Glazier as the president. The high school even proclaimed May 17th to be “Natural High Day”. The day started with the students alternating between watching the Natural High 4 DVD Series and attending an assembly. The Natural High 4 DVD Series features the band Relient K, professional skater Paul Rodriguez, Jr., NBA player Mike Conley, Jr., professional surfer and musician Timmy Curran, and many more. The DVD shows the youth how they can live up to their potentials and achieve their goals without the use of drugs and alcohol, and was distributed to every middle school in the United States in September 2009. The assembly began with speakers Chelsie Hill, a Pacific Grove High School student who got into the car with a drunk driver and is now paralyzed from the waist down, and Aaron Rubin, a 27-year-old who overdosed on oxycontin and can no longer walk nor talk (watch Hill’s interview about her accident here, and watch Rubin’s story here). At the end of the assembly, Natural High Club president Jenna Glazier asked the students of Rancho Buena Vista High School to stand up if they wanted to pledge to live naturally high, and more than 80% of the students did so. 20 students were filmed by Natural High’s filmmaker Josh Landan, pledging on camera to live naturally high. These students will potentially be featured in the next video, Natural High 5 DVD Series; this video will also feature the band Hey Monday and fashion designer and actress Lauren Conrad. Natural High is currently working on making the Natural High Pledge virtual so that those who want to sign it can do so online. The pledge will also be available at the following Vans Warped Tour dates: Pomona, CA (July 1st), Ventura, CA (July 3rd), San Diego, CA (August 9th), and Carson, CA (August 10th). To learn more about Natural High, visit their website online or go to their Facebook page. I love that you wrote on natural highs. Its so great when you can have that in your life and you dont need artificial substances. I am so impressed by your blog though. Adding all the musicians into it was very interesting and I love the look of you blog. I would read this even if it wasnt for an assignment.